Always thinking of our fat-stringed brethren, we had to make a 3-channel, programmable, rig-in-a-box for bassists who can't get enough of a great thing. Like the TRI-A.C. for guitar, you get three hot tones right at your toetips. The all-analog circuitry features the same controls as its single channel predecessor: Drive, Bass, Treble, Presence, Blend and Level. Digital only in its programmability, you just tweak the knobs until you find a tone, double-tap on a footswitch, and it's saved in that channel. It's that simple. Three of your faves – to go! 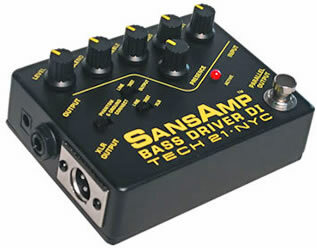 Much more than just a direct box, the SansAmp Bass Driver DI is capable of dialing up big vintage tube tones, bright modern slap sounds, gnarly distortions, and all in between. Three different outputs to drive power amps, recording desks, PA mixers, or simply enhance your current rig. Controls include Presence for definition and upper harmonic content; Blend to combine the proportion of direct signal and SansAmp circuitry; and active EQ specifically tuned for bass with 12dB of cut or boost. The controls offer a broad range of traditional bass amp sounds, including such meaty styles as Bassman® and SVT®, as well as raunchy, crunchy overdriven sounds that would typically require a multitude of effects units. 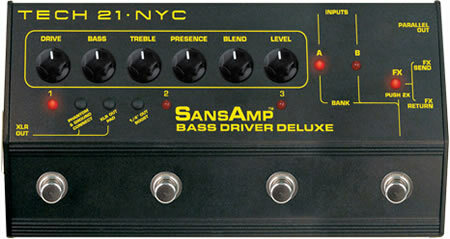 For bassists who like to switch it up on stage, the SansAmp Bass Driver Deluxe is the ultimate live tool for the bass-hopping, preset-stomping player. The Deluxe is all about fast delivery of monster Tech 21 bass tones in the fray of a live performance. Dual inputs enable two instruments to be on-line and ready to go with a pop-free selector. You can program three custom tones for each input, or use all six for a single instrument. You can also program the FX loop to engage your favorite effect with a particular setting and the Deluxe will bring it every time that preset is selected. “Architecturally” create your own rig in seconds. You can easily achieve the most sought-after tube amp sounds, and entirely new ones as well. Choose amplifier type, modification and speaker cabinet/mic placement configurations. You can easily mix and match specific sound characteristics in ways that would otherwise be physically improbable, probably impractical and definitely not cost effective. 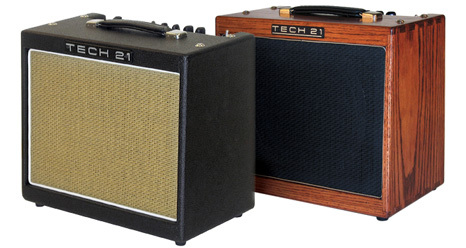 The GT2 is a truckload of great amps in a single, simple pedal. 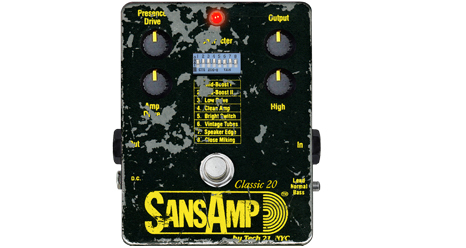 In celebration of our 20th anniversary, we proudly present a special relic-style version, the SansAmp Classic 20. 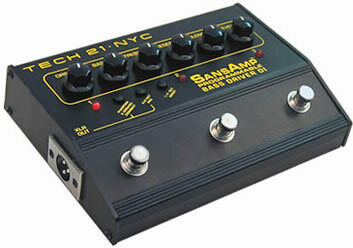 The exterior design is taken from an actual “vintage” SansAmp pedal used on a world tour by a renowned artist. The main heart of the circuitry and inner workings remain virtually unchanged. 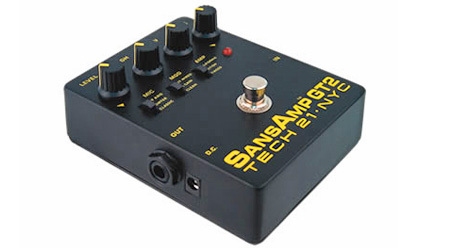 Of the pedal formats, SansAmp Classic is the most sophisticated and a tweaker’s delight. Its unconventional design not only keeps the unit compact, it is key to the wide range of sounds you can achieve. There is a bank of eight Character switches to adjust tonality, harmonics and dynamics. A 3-position input switch gives you a choice of preamp styles: Lead (Marshall®-style), Normal (Mesa Boogie®-style), and Bass (Fender®-style) which is excellent for rhythm as well as bass guitar. Four knob controls shape pre-amp contours, power amp contours, volume and final tone. The SansAmp Classic was designed to recreate the natural sound of tube amplifiers -- without effects, so you can have a solid foundation of tone upon which to build. It is specifically engineered with a flat output to provide maximum flexibility and control with external EQ. The SansAmp Classic offers countless (we know, we’ve tried) combinations and permutations for you to explore. Channel 1 offers a range of Fender® styles, from chiming clean to sizzling, saturated 'tweed' tone. The cunning Punch control sets the amount of midrange break-up and overdrive, and a Bite™ button tightens the low end and adds brightness. Things get way raunchier over in Channel 2, with amp sounds ranging from crunchy Marshall®, to gnarly Vox® AC30, to slamming Mesa® Rectifier styles. A Weep™ button increases the amount of even harmonics and thickens the sound. Its powerful and sophisticated midrange control, appropriately named Growl™, can produce brutal 'scooped' tones without any loss of girth or volume. The powers of the Trademark 60 are many. Experience how this soulful combo can work its magic like a tonal Tiki god. We call this our Direct Recording Combo Amp. We should have called it Yoda, because there isn’t much this diminutive wizard can’t handle. The heart of the crafty Trademark 30 is a modified version of the super flexible SansAmp GT2 pedal design. Construct your tone by selecting amp character, gain structure and speaker type, and then use the drive controls and active three-band EQ to nail your sound. The 30-watt output is plenty loud for practice and monitoring but the balanced XLR and 1/4” outputs bring the big tones of this little combo to the studio mixer or PA system. Bedroom, rehearsal, studio or club, the Trademark 30 will prove it’s a giant amongst compact combos. Though we strive to provide accurate information, MicroDot Music is not responsible for any errors in product related information on our site and we encourage you to verify any such information with each manufacturer.